I went to a large public university. I recall back then learning that the student tuition paid for around 10-20% of the schools budget. Today public schools get a higher % of their money from tuition but most of their money is still from other sources primarily from state, local and federal government money. Private schools get a larger portion of their money from tuition and also have larger gift and endowment funding. But private schools also do get a significant portion of their money from governments. How does it all add up? The Delta Cost Projects Trends in College Spending 1998-2008 report has information on the source of revenue for universities. In the report, Figure A1 has the revenue per student for each category broken down by each type of institution. If you add that to the # of students for each type of school in figure 2 of the report, we can find out how much money each type of university gets from the various sources. The math is simple, e.g. just take the # of students at the type of university then multiply by the average funding per student and you get the total funding for that type of university. Add up all the funding from all the sources and you can find the % of funding for each source. Unfortunately the numbers for the # of students in the report are in a graph and not I had to estimate the actual figures based on the graphic. Because of that all my numbers here are going to have a margin of error of 1-2%. Tuition - this is the NET tuition after accounting for student aid. So this is the total amount of tuition the schools get after things like scholarships or tuition waivers. State/local government - This is various funding from state and local governments. It may be outright tax subsidies or grants for specific projects. Other - this category includes other sources of money like student housing, athletics, teaching hospitals etc. Private - this is gift and endowment money. Note that here we're ONLY looking at money that goes straight to the universities. So this doesn't cover how student financial aid is handled. Student aid comes from various sources and pays the tuition and room and board for students. So for example if the government gives a student loan to a student and the student then uses that money to pay the tuition bill then that money shows up in the tuition category. A large portion of the tuition segment of funding comes from student aid which has other various sources. For all universities its a mix of private and public universities. This is heavily weighted towards public schools since the large majority (about 80%) of college students go to public schools. As a whole government funding including the state, local and federal portions provides 44% of university budgets. 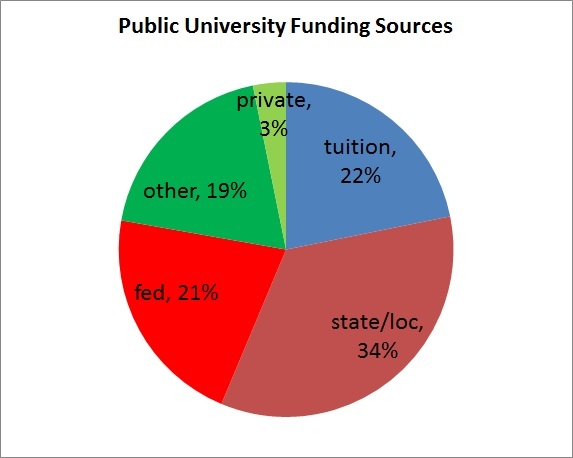 Government is the largest single source of funding for universities in the US. As you'd guess the public universities get even more of their money from government. For public schools government is the majority source of funding and contributes 55%. Private students pay larger tuition bills in general and their tuition money accounts for the largest single source of revenue at private universities at 44%. 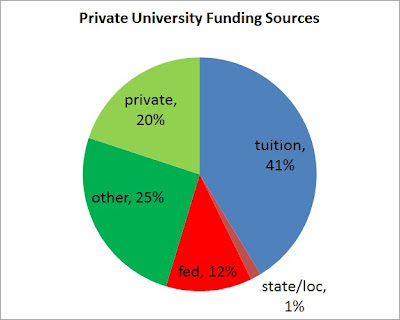 However private universities do also get tax dollars in various ways and they get about 13% of their funding in total from government sources. Private gifts and endowments also play a larger part in private school funding at 20%. Of course these numbers are nation wide total funding sums. The figures will vary greatly from state to state and from university to university.